Tales of a summer with a 91 (now 95!) year old: A successful outing! Finally! A break in the weather meant an 80 degree day and a chance to blast Gert out of her chair so that's exactly what I did. 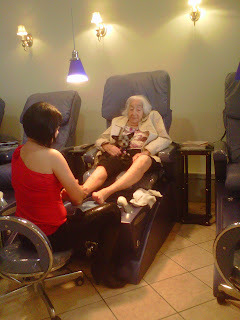 Under protest anyway, Mom finally gave into a pedicure (what girl wouldn't?) 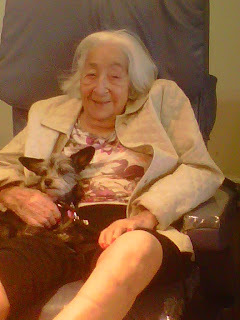 so off we tottled to Damascus to Serenity Day Spa where Lily gives great mani and pedi. Gizmo came along for the ride - she's such a great dog. Just content to sit in Mom's lap. Lily, the manicurist extraordinaire loves Mom and me and couldn't be more accommodating in helping me get her into the chair, etc. She's really a great woman. If you're in the area and need your nails serviced, that's the place to go. It's right on the main drag and in the same little shopping center as Tom and Ray's Diner. And, for those dog lovers out there, the Top 5 dog nail grooming tips. Ok, enough self-promotions, for the moment at least. After nails, I talked Gert into a trip to the Home Place up in Mt. Airy but, not before a quick stop at Jimmy Cone for a cup of vanilla ice cream that she shared with Gizmo (to be honest, Gizzy only got to lick the bowl - Gert took care of the rest). Jimmy Cone is definitely the best ice cream to be had in the continental US. Luckily, they had just opened for the season so Gert got her first fix. The Home Place netted us a bunch of stuff we weren't looking for. I started off looking for king size sheets for my new temperpedic bed but ended up with a bird house, a grill brush, jordan almonds for mom, a jar of seasoning, peach apricot jelly for Mom, and a dog collar for Rita. See how this goes? So, I'm still looking for a few very nice sets of sheets. My bed is being delivered the beginning of May and I can't wait. No one should sleep in a queen when a king is available! Dropped Mom back off at the house where Kelly took over and then John and I headed over to La Mex to soak up a few rays of sunshine on the patio. Good friend Jeff dropped in for a quick beer and to sit a spell. John got himself a new toy - the latest iPhone so, of course, we had to play with the double cameras. The shots following were all taken with his phone. He's such a Mac boy! I, on the other hand, did not pay for the new iPhone - instead, John's giving me his iPad touch which is basically the iPhone without the phone (I refuse to give up my blackberry). All in all, a great day was had.